Tasting Paris features new and classic French recipes and cooking techniques that will demistify the art of French cooking and transport your dinner guests to Paris. Whether you have experienced the charm of Paris many times or dream of planning your first trip, here you will find the food that makes this city so beloved. Featuring classic recipes like Roast Chicken with Herbed Butter and Croutons, and Profiteroles, as well as newer dishes that reflect the way Parisians eat today, such as Ratatouille Pita Sandwich with Chopped Eggs and Tahini Sauce and Spiralized Zucchini Salad with Peach and Green Almonds. 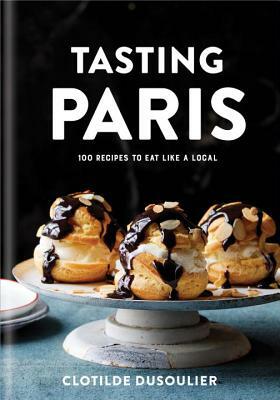 With 100 recipes, 125 evocative photographs, and native Parisian Clotilde Dusoulier’s expertise, Tasting Paris transports you to picnicking along the Seine, shopping the robust open-air markets, and finding the best street food—bringing the flavors and allure of this favorite culinary destination to your very own kitchen.